MDCT urography allows fast and high-resolution volumetric scanning of the urinary tract in a single comprehensive examination, termed “one-stop-shop modality,” offering several three-dimensional post-processing features including multi-planar reformations (MPR) and maximum intensity projection (MIP) images. In most centers, a three-phase CT urographic protocol, consisting of unenhanced, nephrographic, and excretory phases, is performed. An alternative is represented by the “split-bolus CT urography”: a combined nephrographic and pyelographic phase allows for a simultaneous assessment of the renal parenchyma in the nephrographic phase and the pelvicalyceal system in the excretory phase by acquisition of only a single CT scan. 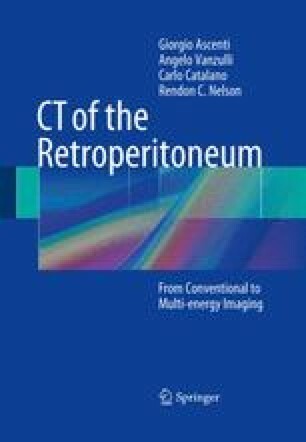 The advent of dual-energy CT represents a unique opportunity for CT urography to significantly reduce the radiation dose while ensuring high diagnostic performances. From a clinical point of view, the advantages of spectral-based iodine extraction with subsequent creation of virtual unenhanced images can be maximally exploited if a split-bolus CT urography injection/acquisition technique is carried out. The simultaneous nephrographic parenchymal contrast enhancement and urographic excretion allow the radiologist to detect urinary stones or parenchymal calcification on virtual unenhanced images, to characterize renal lesions by means of color-coded display of the iodine distribution in the scan field, and to identify urothelial lesions.